هذه الماكينة تستطيع أن تستخدمها بكل سهولة على جميع أنواع الدهان الجديد والمهمل دون تدريب بإستخدام مواد ميجوايرز المتعددة. هذه المجموعة الموفرة للمال تحتوي على : الماكينة ، شنطة قماشية، باكينج بليت 5 انش ، دسك بحجم 5 انش للكومباوند، دسك 5 انش للبولش ، دسك 5 انش للفينينشج ، علبة من مادة الكومباوند ، علبة من البولش ، علبة من الألتيميت واكس ، 3 قطع مايكروفايبر. I have never used a machine polisher in my life but was looking for that swirl free finish on my new car. I watched the instruction videos on YouTube and took the plunge. I followed the advice given and wow what a result. I was afraid of burning my paint but the start mechanism and double action of this machine made the job so easy. It is easy to change the pads, they clean up easily and the machine is comfortable to use. Changing the speed with the rotating dial is a doddle and it even tells you which is the recommended speed range for each step of the process. I have been since asked how I get my car so clean and am pleased to tell everyone. I use all Meguiars products and even keep a bag in my boot with all the quick detailers. My wife no longer calls it my shed, but my "Detailing Shack" where I keep my polisher and products. In summary this is a very ease polisher to use and safe even for a novice, I wouldn't hesitate to recommend it to anyone, it is quite simply awesome. My wife no longer calls it my shed, but my \"Detailing Shack\" where I keep my polisher and products. 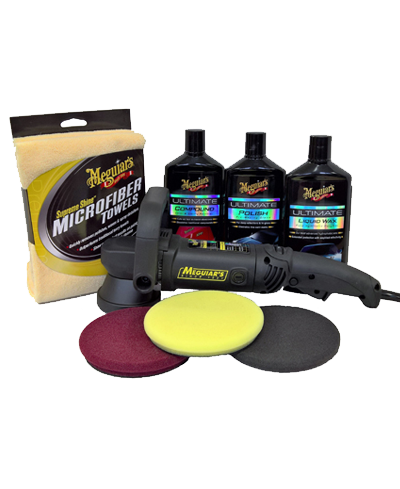 In summary this is a very ease polisher to use and safe even for a novice, I wouldn\'t hesitate to recommend it to anyone, it is quite simply awesome.